Adventurer and author Sally Kettle is the first woman to row the Atlantic Ocean twice from East to West, and once with her mother! She has also taken part in the last leg of a World Clipper race and retraced WW2 heroine Nancy Wake’s steps across the harsh Pyrenees. Chair of the Trustees for The London Sports Trust she is an Ambassador for the Girl Guides and is a huge supporter of Shelterbox, volunteering as part of the International Shelterbox Response Team. Sally writes and presents pieces for BBC Radio 4, including “Does Hope Help? ” for Four Thought and “Jonathan the Tortoise – Operation Go Slow” – for From our Own Correspondent. 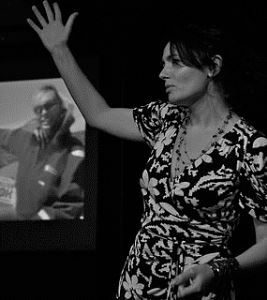 An impressive presenter, she is also much in demand speaker whose speeches are both hilarious and informative, and evoke a whole range of emotions, and her account of rough seas, wild storms, harsh living and encounters with sharks which she delivers in stupendous style. To enquiry about Sally Kettle please contact us today. Sally is the first woman to have rowed across the Atlantic east-west, twice. She first took to the oars in 2003 and following an initial set back to her first Atlantic attempt, she was joined by an unlikely rowing partner – her mother Sarah Kettle. 106 days later they made it into the record books as the world’s first mother and daughter to row an ocean. In 2005 Sally founded Rowgirls – an all female rowing team striving to break the record for the fastest Atlantic crossing. The team of four were struck by disaster when a crewmate left the boat mid-Atlantic. Subsequently the boat lost its rudder in the worst recorded conditions in 200 yrs and a shark attacked the boat – no lives were lost. Unwilling to give up, Sally and her crew completed the challenge. They arrived in Antigua 77 days later, and became the first three-handed boat ever to complete the trip. Sally’s Odd at Sea (Orana, 2007) – is the autobiography detailing the ocean journeys and the motivations behind them. It’s an honest account of her struggles to bring the teams together, and of the difficulties faced when living in a boat smaller than the average bathroom. Sally subsequently embarked on further adventures and shares her experiences with audiences around the globe. Many of Sally’s adventures have included the opportunity to raise over £300,000 for charitable causes. Please don’t hesitate to contact us for speaker or event host recommendations – our team are always happy to help.